Every once in a while, a Intel roadmap leaks out. This week, another detailed roadmap regarding Intels next year plans surfaced online. For us as the media, roadmap-leaks are something nice. They give us insights that the manufacturers don´t want to give us yet. Especially Intel roadmaps are something that leaks out regularly. 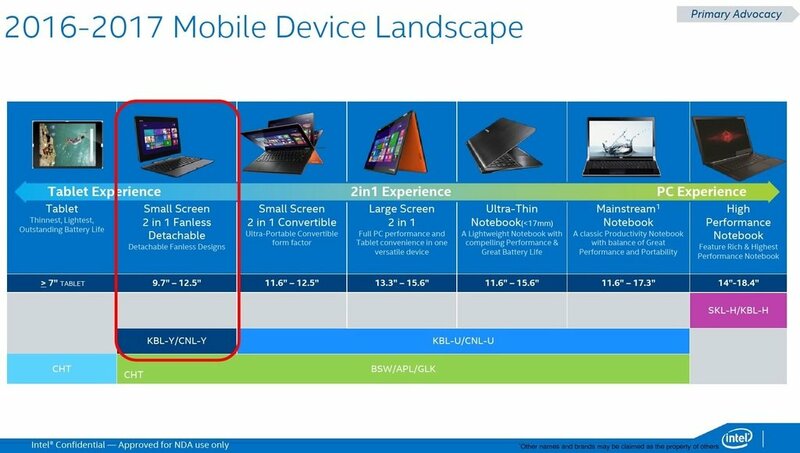 The source for this leak is the Anandtech-forum. The roadmap reveals more details regarding Intels next-next CPU platform. It was already known that Cannonlake, the 10 nm refresh of Skylake, would be out in the second half of 2017. Now we also know that Cannonlake will hit the market only at the very end of 2017, in the mid 4th quarter 2017. The majority of notebooks with the 8th gen of Core i CPUs likely won´t launch until early 2018. Also, Cannonlake will only launch in the Ultrabook- and Hybrid-categories, faster Quad-Core models aren´t even in the roadmap. Intel plans something different for the high-performance segment: Because of an earlier leak we already know about the existence of the platform codenamed "Coffee Lake". Coffee Lake is another 14 nm refresh of the Skylake architecture, another iteration of Skylake, just like Kaby Lake. The significance of Coffee Lake lies not within its architecture however: Intels plans to release Hexa-Core notebook CPUs for the very first time. This is the first time since the Core 2 Quad CPUs that Intel increases the number of the CPU cores in Notebooks. According to the roadmap, all Hexa-Core CPUs will have a TDP of 45 W and will be accompanied by a GT2 GPU. 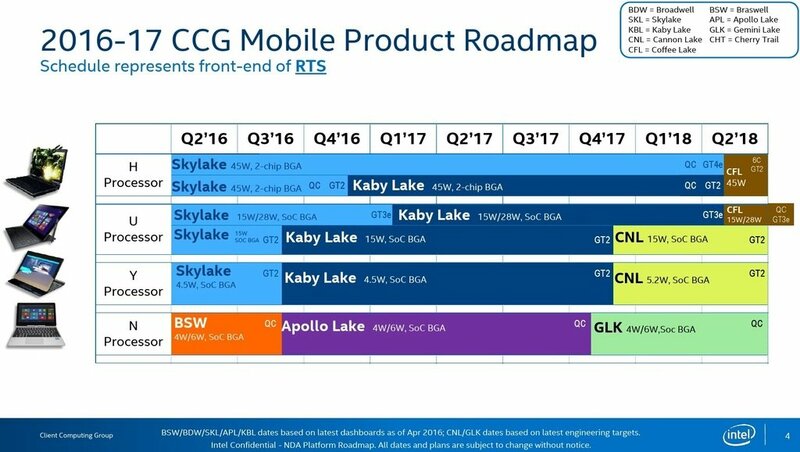 According to the roadmap, Skylake will continue to be in the market in one segment. High-End Quad-Core CPUs with Iris Pro GPUs like the Core i7-6970HQ will stay in the market till the released of Coffee Lake in 2018. There will be Kaby Lake CPUs with four CPU cores, but these will be accompanied by GT2 GPUs only. Not in the roadmap are Kaby Lake CPUs with four cores and TDPs of 15 or 28 W. They were however mentioned in previous leaks, in the roadmap they are only listed for Coffee Lake. The current CPU platform Kaby Lake will hit its wide-availability-point in early 2017. So far only a few Kaby Lake CPUs in the Dual-Core segment have been released.